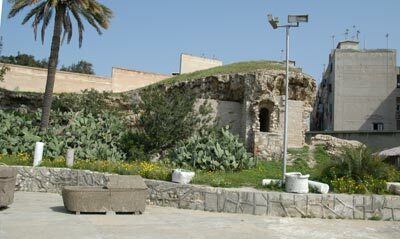 In the middle of Alexandra is an unassuming stone building, almost covered in grass -- beneath which is the huge underground necropolis of the Catacomb of Shouqafa. The houses above are two hundred years old, built over the honeycombed stone beneath -- the catacombs were discovered when a donkey stepped through a thin part of the roof (you know, donkeys find quite a lot of stuff in Egypt). 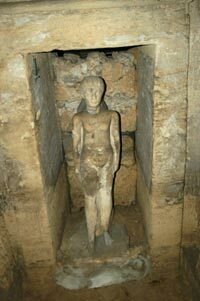 These catacombs were originally a private crypt, but were later extended with more roman burials. 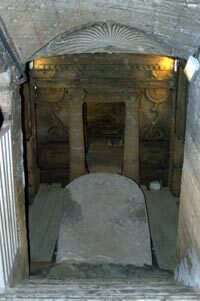 People are buried here in sarcophagi, in shelves, and in urns of ashes after cremation. They are empty now, of course, and the lower levels have been completely flooded by the rising water level in Alexandria. 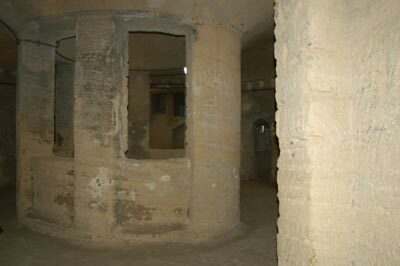 These catacombs are called Shouqafa, Shoukkafa, es-Shoqafa -- a number of different anglicized spellings, depending on which book you are reading. It means "Mound of Shards" and refers to the crushed pottery found inside, where banquets were held for visitors to the dead.